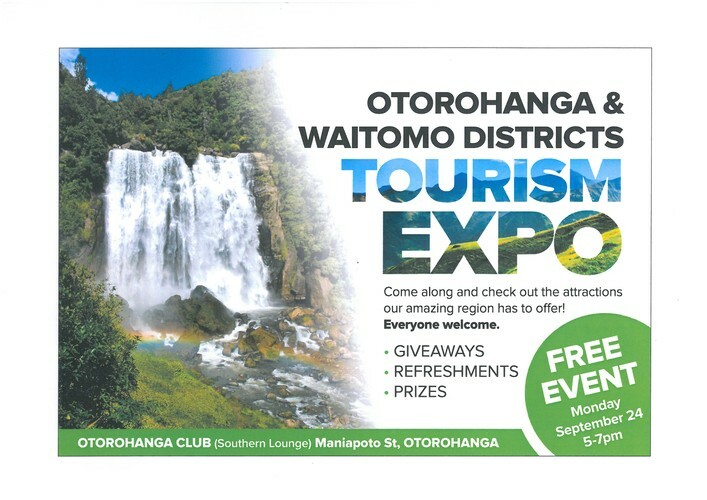 After a cold, wet winter the Otorohanga i-SITE Visitor Centre staff have been busy organising an Expo for tourism operators from both the Otorohanga and Waitomo districts. We would like to invite you to come along to this free event. It’s a great way to shake off winter and embrace the exciting summer tourism season that is on its way. There will be a wide variety of tourism operators displaying their businesses, so come along and get acquainted with the people who dedicate themselves to making this region such an adventurous and amazing place for visitors and locals. Our aim is to encourage everyone to become ambassadors for this beautiful place and to be able to pass on their knowledge to our tourism guests. We have received fantastic support from many of our local tourism businesses with donations of great prizes for the night. If you are a business that is involved in tourism in any way, please drop in to the Otorohanga i-SITE any written promotional material you may have e.g. brochures, business cards, menus. We will do our best to display it for you on the night. Otherwise see you at the Otorohanga Club function room on the 24th September 5 – 7pm. (There will be refreshments served but No alcohol). This event is funded by the Otorohanga District Development Board.